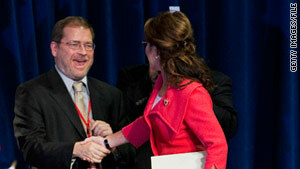 Grover Norquist, shown greeting former Alaska Gov. Sarah Palin last year, leads the group behind the no-tax-hike pledge. (CNN) -- Some political analysts watching the debt ceiling talks in Washington lament that the no-tax-hike pledge signed by most congressional Republicans may prevent a grand compromise in which tax increases accompany spending cuts. To the man who leads the interest group behind the pledge, that's pretty much the idea. Grover Norquist, president of Americans for Tax Reform -- the group whose oppose-all-tax-increases vow was signed by 235 House members and 41 senators, almost all of them Republicans -- said the pledge is doing what it's supposed to: preventing what he says are mistakes of 1982 and 1990, namely agreeing to tax increases and watching promised spending cuts evaporate. "When you take the pledge, it ends the constant badgering of people asking you to raise taxes here, there and everywhere," said Norquist, whose group wants to shrink the federal government and believes any new revenue would enable continued government growth. "Once you keep putting a tax increase on the table, spending cuts disappear." "If someone says that this makes it difficult to make a big budget deal (with tax increases), that's the point," he said. "... The only reason that (President Barack) Obama is even talking spending restraints is because of this pledge." Debt clock's ticking, can deal be found? Signed pledges are nothing new for politicians, but the debt talks and the approaching presidential campaign make them hard to miss. Some political analysts, including CNN chief political analyst Gloria Borger, are particularly vexed with Americans for Tax Reform's Taxpayer Protection Pledge. In a column, Borger argued the pledge may prevent what signees otherwise would want -- Democrats' approval of significant spending cuts and entitlement reforms as part of a deal to trim the United States' $14 trillion debt. Administration officials say the country needs to raise its $14.3 trillion debt ceiling by August to avoid a partial default on loan obligations, and Republicans have demanded spending cuts as a prerequisite. Obama says that in return, he wants new tax revenue -- largely in the form of ending Bush-era tax cuts for wealthy Americans in 2013 -- to combine with the cuts to reduce the debt by $4 trillion over the next 10-12 years. Republicans, though, say they won't sign on to any tax increases. "Pledges are proliferating in political campaigns, and people are being asked to sign up to things that ... (in some cases) lock their hands so they can't act," CNN senior political analyst David Gergen said. It's yet to be seen whether the tax pledge will keep tax increases from a debt deal. In any event, interest groups' visibility is growing, and so is the tactic of demanding signed pledges from politicians, said Stuart Rothenberg, editor of the nonpartisan Rothenberg Political Report. "Politicians used to look to guidance from parties. Now they look to guidance -- or threats -- from interest groups," Rothenberg said. "As parities have diminished and these outside groups have flourished, I think you see more of these pledges." There are old-fashioned, spoken campaign promises. And then there are pledges that interest groups fashion and a candidate signs, presumably knowing the group is prepared to announce any signee's deviation to the public. Conservative groups aren't alone in pushing pledges. The Progressive Change Campaign Committee says more than 120 members of Congress, nearly all of them Democrats, are signees of a pledge to not privatize Social Security or raise the retirement age. "I think there's a tendency for candidates to believe they have to appeal to the base, and there's a kind of threshold of credibility that they need to achieve, and that leads them to signing these pledges," Rothenberg said. He said there's no good data on how useful pledges are to candidates. The utility depends on the issue mix and the candidates' credentials and skill -- many refuse a pledge and cast themselves in a I-decide-for-myself light. But in some cases, "if you don't sign the pledge, it can define you as a candidate, and you might spend the rest of the campaign defending and trying to move away from that issue," Rothenberg said. GOP presidential candidate Jon Huntsman, a former Utah governor, has made some high-profile refusals to sign pledges, including the "Cut, Cap and Balance" vow that demands Congress oppose raising the debt ceiling unless it makes significant budget cuts and passes a balanced-budget amendment to the Constitution. His refusal to sign that pledge, pushed by a coalition of conservative groups and signed by most other GOP presidential candidates, led U.S. Sen. Jim DeMint, a Tea Party favorite, to say Huntsman was out of the running for his support. "Other than the pledge of allegiance, I don't do a whole lot of pledges," Huntsman told CNN last month after DeMint's statement. While pledge skeptics say vows leave little wiggle room for compromises that might achieve good things for the public, proponents say voters want to know that their elected officials will maintain the positions they took on the campaign trail -- positions for which they may have sent them to office in the first place. "I think there is a lot of backroom-deal fatigue outside (Washington), and what people want more and more are politicians who stand up for principles and make tough decisions that aren't politically convenient," said Joe Brettell, who works for CRC Public Relations and represents the groups behind the "Cut, Cap and Balance" pledge. The Susan B. Anthony List asks presidential candidates to commit to its Pro-Life Citizens Pledge, in which signees agree to, among other things, select only anti-abortion rights appointees for certain Cabinet and executive branch positions. The group's communications director, Ciara Matthews, said "no one wants a candidate who goes out on a campaign trail and say, 'When it comes to debt reduction or pro-life issues, I don't know what I'm going to do.' "
"Candidates gain support when they make a promise that appeals to the greatest number of voters," Matthews said. "To somehow make a distinction between promises spoken and written, and saying that only written promises constrain elected officials (from compromises), would insinuate the support of broken, spoken promises." Norquist said his group's anti-tax-raising pledge "makes it easy for public officials to make clear what they are." "The pledge says 'I won't raise taxes, no questions.' When you sign, journalists, competitors (and others) all know what you did. There's no ifs, ands or buts about your statement," he said. "If you promise and break your word, chances are you'll lose your next election."